Fort Myers Florida news and information. Lately our office has been inundated with calls from investors throughout the country looking to snap up foreclosure listings at bargain basement prices. It’s true, we do have some bargain prices, and foreclosures tend to be a good deal. Most of these investors want to only talk to the “Listing Agent” because they believe they’ll get the inside track on these deals. There are some investor gurus out there selling tapes on how to buy these foreclosures, and as a foreclosure listing agent for many of the banks I can tell you that the advice given won’t help you much, so save your money on these tapes. If the property is a bargain, offer full price or better. Most of the foreclosures sell at or above full price. From personal experience our listings do, so we decided to pull up the entire MLS sales for 2009. Of the 8,080 single family home sales, the average List Price/Sale Price Ration was 99.02%, and if you look at median prices it was actually 101.8%. So the stats do match what we’ve experienced. Be prepared to offer proof of funds with your cash offer, or a pre-approved letter from a major bank. Many of the banks require a pre-approval letter from the bank handling the foreclosure so they know they’re taking the property off the market for a good buyer. Place more money in escrow. Believe it or not, banks do look at how much you place in escrow with your offer. Make sure it is not contingent on the sale of another property. Banks are not taking contingent offers. Work with an agent familiar with the process. In most cases listing agents take the information from your offer and input key bits of data online. The bank never sees your offer on the paper it is written until they accept one of the offers. Do not make the listing agent hunt you down for crucial information. Most properties have multiple offers, and the listing agent will just move on to the next offer filled out completely and correctly. Use an experienced agent who knows how to properly write a contract. If anything does not make sense, the bank will reject that offer and go with another offer they have confidence in, even if it is lower in price. Asset managers get graded on how close the final offer is to list price, and if they make the scheduled closing time. Asset managers get very nervous with offers that aren’t written well, as that’s a key sign the selling agent is poorly trained or new. If the agent is inexperienced, the confidence level of that closing taking place on time, or at all is compromised. When a bargain comes on the market, don’t waste time. It may be too late by the time you find out about it, so be ready. If you know the market, and know what you’re looking for, be prepared to act. This is no time for “Buyers Remorse” as the market will spit you up and eat you alive. Do your homework. Do not buy at the courthouse steps unless you are an expert in inspecting and title. When buying from a bank, do your inspections, read the bank contract closely, and know the market ahead of time. You’ll have little time to act, so be prepared ahead of time. These tips, along with professional advice from an agent experienced in buying foreclosed property will serve you well, and give you the best chance of getting that bargain you’ve dreamed of. Good luck, and happy house hunting. Watch The Future of Real Estate Video Show as we explain this and more. This week we’ll focus on freshly updated numbers for the distressed segment of the Lee County real estate market. It’s important to study this segment of the market as it has been responsible for a large chunk of sales, and has influenced pricing in the market. As you can see from the chart, distressed sales in Fort Myers have fallen precipitously in the last 3 months, down from almost 73% in July to 58% in September. Short sales in Fort Myers have increased about 20% and foreclosures have dropped 35% while overall sales have remained relatively constant. This tells us that banks are working to sell properties as short sales in Fort Myers as opposed to acquiring the property through foreclosure and selling later on at much lower prices. Cape Coral on the other hand has seen about a 15% drop in overall home sales since July. Distressed sales have remained relatively even, hovering around 70% all 3 months. Foreclosure sales have dipped almost 26% since July while short sales have increased 9%. This tells us that the demand in Cape Coral is directly tied to the bargain, meaning as the distressed inventory has fallen in the Cape, so have overall home sales. Statistically, buyers in the Cape are all about the bargain, and as home prices have increased in the Cape, home buyers have moved to Fort Myers and potentially Lehigh Acres for the bargains. 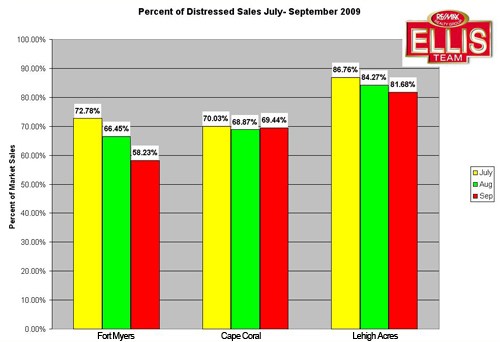 Lehigh Acres has seen a slight fall in distressed sales, down from almost 87% in July to 82% in September. 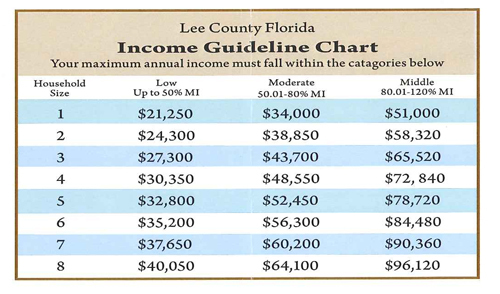 Lehigh Acres is still far and away the distressed capital of Lee County. Overall home sales in Lehigh Acres have fallen almost 13% from July to September. Foreclosure sales in Lehigh Acres are down 18%, while short sales in Lehigh are down 17%. This is why home sales are down overall about 13% as Lehigh Acres, along with Cape Coral are both proving to be price sensitive markets led by first time home buyers and investors. Fort Myers seems to be much more stable at this point in time. We are seeing a trend towards more expensive properties coming to the market via foreclosure, so it will be interesting to see where these properties are located and how it affects demand and pricing in each of the three major markets in Lee County. Congress has extended the first-time home buyer tax credit to purchases made through April and closed by July, and added a provision for existing home owners who have owned their home for at least 5 years. Unfortunately, in this sagging market it doesn’t give them much time to sell their home and close on a new one to take advantage of this provision, so only a select few may be able to purchase a new home before selling the older home. We think Congress could have done a much better job writing this bill. They did add to income eligibility limits, but again the bill limits who can take advantage by July. This may further fuel the bargain end of the market assuming the president signs this bill, which has not been done at the time this article was written. We’re concerned that this bill won’t fuel a total real estate recovery and will continue to spur demand at the lower end of the market. To pull this economy out of the doldrums, a broad based real estate recovery would have served a better purpose, but I guess we’ll take whatever help we can right now. We’ll also monitor the trend of banks accepting more short sales. To date banks have been ill equipped to deal with the magnitude of requests. Recently Bank of America adopted a policy to use its online foreclosure system of working with approved real estate agents called Reotrans and opened it up to short sales. This will allow approved agents to more efficiently move Bank of America short sales through the system. Sellers wishing to sell their home via a short sale should seek out experienced short sale agents who are also familiar with Reotrans. Because they are adding more than just bank REO’s (Real Estate Owned) they are changing the name from Reotrans to Equator. This may revolutionize the way banks handle the massive short sale process and speed up many of these sales. It will also help that they are using agents familiar with the Distressed Sale process. If you’re a seller considering selling as a short sale, it’s almost impossible to go it alone. We recommend hiring a seasoned professional familiar with the intricacies of a short sale. You might seek out a CDPE (Certified Distressed Property Expert). If you’re a current Bank of America customer, you might also seek out an agent who uses and is approved on Equator. This could be a trend that other banks go to as it will ease the communication stream and handling of the data among various agents, negotiators, and investors. This online system could do for short sales what it has done for bank foreclosures, which was to make an online system whereby many authorized people could all work on a file simultaneously and get things done instead of pushing paper from one desk to the next. Stay tuned, as the market is always in flux, and we’ll report interesting changes and how they may affect the market. You’ve heard the expression Tis the Season, and in real estate season can mean many different things depending on where you live, and what type of product you’re referring to. Let’s talk about the Seasonality of the SW Florida Real Estate Market. For many years in SW Florida condo sales were highly dependent on seasonal sales, and in many tour developments that is still true. However, even with condos there are differences. Some condos are located at the beach; some can be rented weekly Vs monthly, and so on. There are only a few golden rules in real estate; Location, Location, Location, and Price. If you over price a home in this market, chances are good it will not sell, and we all know location makes a difference, although some would argue it’s still a function of Price. The better the location, the better the price, but that’s the old chicken and egg theory we’ll stay away from today. Today we thought we’d illustrate some seasonal trends in single family home sales throughout the years. For many years we’ve told people single family home sales traditionally peak in the summer months, perhaps because kids are out of school and that’s when the relocations tend to take place, and perhaps that many of our buyers over the years were move-up buyers and they had more time to look after the Season their business just had. For years we didn’t have large companies employing hundreds or thousands of people, so many of our buyers worked for or owned small business, and they were busier in Season than out of season. We have attracted a few large employers, although a few more would be welcomed by all here I think. Our market has been in turmoil since 2005, so we weren’t sure the charts would show the traditional rule of thumb that home sales tend to peak March through end of summer. Upon further study of the home sales graph, it does seem to hold true even in this time of change that home sales peak in the March through Summer time frame, and as we enter the fall one might expect home sales could decline. This year may or may not be like recent past years as we have a first time home buyer tax credit in play that expires November 30, artificially low interest rates as the government has been buying treasuries at least through October, and artificially low property values due to the distressed nature of the market. Put all this together and you’ve got a Perfect Storm for record sales, and we’ve seen that for the past year. So what could speed this train up or slow it down going forward? In a few weeks interest rates could head up if the government doesn’t decide to keep them lower. If so, rates could shoot up over 6% almost overnight like it did a few months ago last time their decision was about to expire. Additionally, the first time home buyer tax credit could go away, thus taking some motivation out of new buyers in the market. How the public reacts to the overall economy, health plans, stimulus money, bailouts, etc. could also affect public confidence about the direction the country is headed, and affect purchasing decisions. All these could slow the train down. The train could also gain momentum if the government enacted a tax credit for all buyers, not just first-time home buyers. Nationwide we’ve been lacking the move-up buyer, and that’s certainly true here as well. A tax credit for everyone would spur a recovery in the overall market, and may decrease pressure on banks. As tax payers we either spend it here or spend it there, however if we help save the banks and spur home sales we also help the economy and increase jobs at the same time. It would also help if the government keeps interest rates low by buying treasuries allowing the market more time to heal itself. A reform of the newly enacted (May 1) appraisal rules would also help the market, as new rules intended to help have actually hurt, and have not increased quality of many appraisals. We would argue the new government program has increased costs, increased inefficiencies, and spurred out of town appraisers who don’t know the market’s intricacies, but what would you expect when you put the US government in charge of local property valuation rules? Some banks are getting better at evaluating and approving short sales when they make sense and some have gotten worse. How banks make decisions today will affect future foreclosure inventory. We believe foreclosures coming to the market may increase in the next year, which will help sales because inventory has been shrinking, and this will bring more affordable housing to the market to replace dwindling inventory. We don’t see rapid price increases on the horizon until we see job growth, and even though we have artificially low sales prices, we are seeing sales because they are bargains. I’m not sure we’d see anywhere near the sales volume if these bargains went up significantly in price overnight, and this is why I don’t think prices will jump dramatically when inventory contracts until the overall economy heals with the housing market. And this is why we are in favor of a home buyer tax credit for all, so we can heal both simultaneously. The Ellis Team at RE/MAX Realty Group in Fort Myers has long supported baseball in Lee County, and this year baseball has paid back. 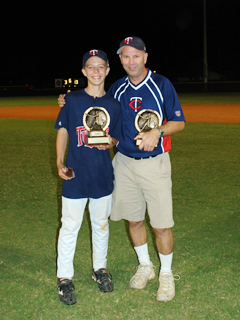 Jason Ellis, Brett’s son played for the Junior Twins in South Fort Myers and the Junior Twins took home the County Championship this past week, which is a tremendous achievement. Paul Hobby managed the team and did an excellent job as he is a great role model with the kids. The coaches all put in extra duty this year to get the kids ready for a winning season, and the kids worked hard too. Brett Ellis and Matt Scott coached the team along with Paul. 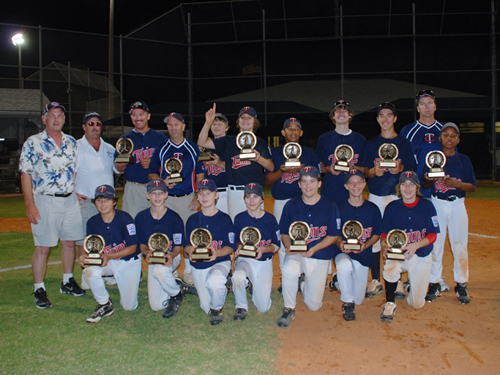 South Fort Myers Junior Twins: The team won the Lee County Championship over the South Fort Myers Red Sox 13-3 on Friday. Of the 23 Junior Little League teams in Lee County, the South Fort Myers Little League had all four of its squads in the county semifinals. 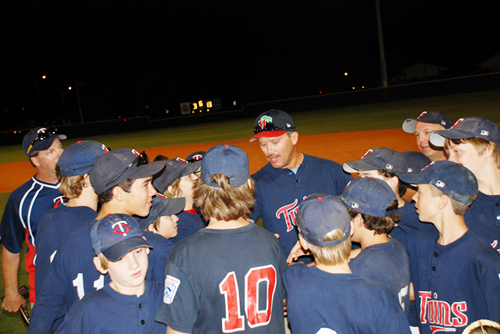 The Twins captured a 9-8 semifinal victory over the SFM Cardinals. The SFM Red Sox outfought the SFM Mariners for a 4-2 victory in the semifinals. Zach Belcher was the winning pitcher for the SFM Twins in the championship game, pitching five innings. Read News Press coverage of Title Game. Fort Myers and Cape Coral saw a 128% increase in home sales over last year as reported by the Florida Associatiopn of Realtors. Statewide sales were up 24%, but locally they were up much greater becuase affrodability is back in the SW Florida real estate market what is not priced into all Florida markets. 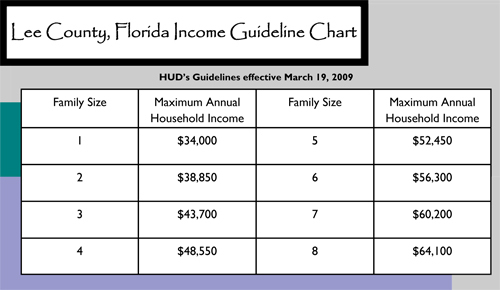 Median sale price is Fort Myers and Cape Coral dropped to $141,400 from $231,600 last year. Condo sales in Cape Coral and Fort Myers saw a 50% rise in condo sales over last year, while the median price dropped 17% to $185,000. Home sale prices declined for the 4th straight month in Fort Myers and Cape Coral real estate. 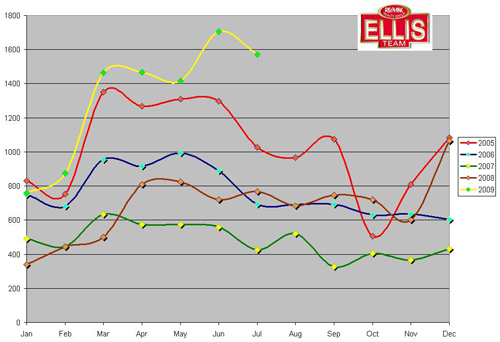 See our month over month prices graph. 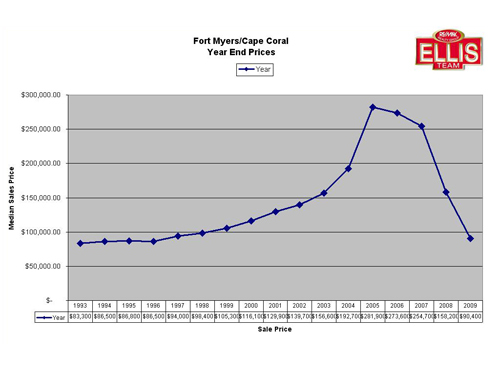 You can also view a monthly price summary by year for Fort Myers and Cape Coral real estate. 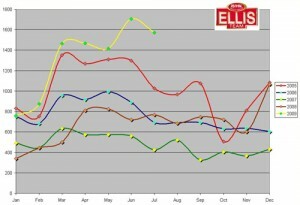 We’ve also included a home sales by month for the past several years for Fort Myers and Cape Coral. We’ve created some videos for you to learn about the SW Florida real estate market better. Some of these videos were newscasts done on TV, while others were simply us on a video camera talking about the market in our office. We’ll be adding more videos like the newscast we did for NBC Nightly News with Brian Williams a few weeks ago, so stay tuned. Thank you for reading our SW Florida Real Estate Home Sales Statistics update this week. We look forward to bringing you further SW Florida Real Estate Home Sales Statistics.